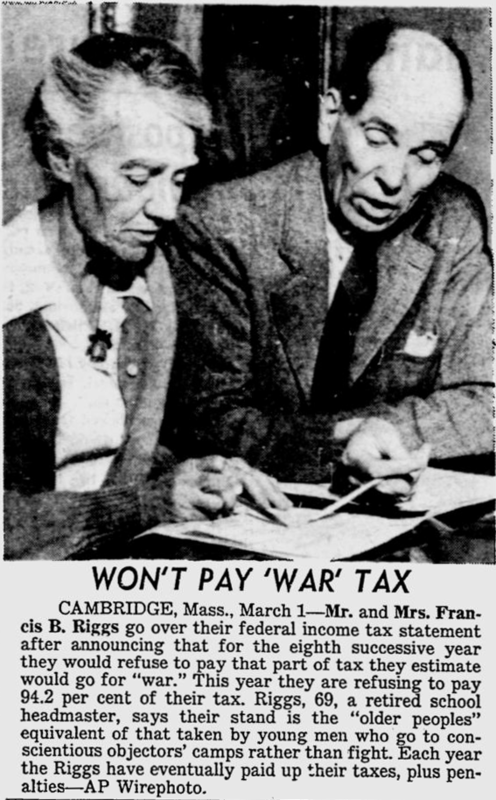 Boston — AP — The tax collectors always catch up with Mrs. Francis R. Riggs — by her own admissions — but she feels she scores a point. The Cambridge woman was one of nearly a score of persons who participated in a public protest yesterday against use of tax funds for military purposes. She told reporters that for seven years she had deducted from her federal income tax that proportion she believes is being spent to prepare for war. This year, she said, she and her husband are withholding 39.3 per cent of their tax. The posters said members of the group represented the Fellowship of Reconciliation, the War Resisters’ League and the Peacemakers. They walked for an hour on Tremont Street between Park and Boylston Streets. The protest was timed to interest workers hurrying home at 5 P.M. The Saga of Valerie: The Tech receives all sorts of mail — bills, checks, Clipsheets from the Board of Temperance. But in garnering material for this article, I was handed a letter with the scribbled commentary, “required reading.” It is from one Valerie Riggs, who says that she has refused to pay income taxes since 1944 and is refusing again this year because, to put it simply, she doesn’t like the way the government is spending it. She says that “…those in our government who are deciding our fate for us … are consulting the cleverest minds in science to concoct the most diabolical schemes for killing innocent men, women, and children…” This is probably accurate enough to make the boys in Ballistics run their fingers around the insides of their collars, but Valerie has found the solution, fellows! Just refuse to pay your taxes, and the world situation is solved! Let’s all Laissez-faire with a big bang! We appreciate the thought, but someone, whose initials are V.R., is being awfully idealistic. There is even an organization known as the Peacemakers whose members are doing the same as Valerie. So if any of you want to do away with your taxes, we can give you the address of these people and you too can refuse to pay. There’s only one catch — it’s illegal. Whittier, Calif. March 14 — (AP) — A Quaker pacifist couple have mailed their income tax returns to the Bureau of Internal Revenue, minus 72.6 per cent of the tax due, which they figure is the amount the government would spend on war.